Solving technical issues is generally simpler than most people think. 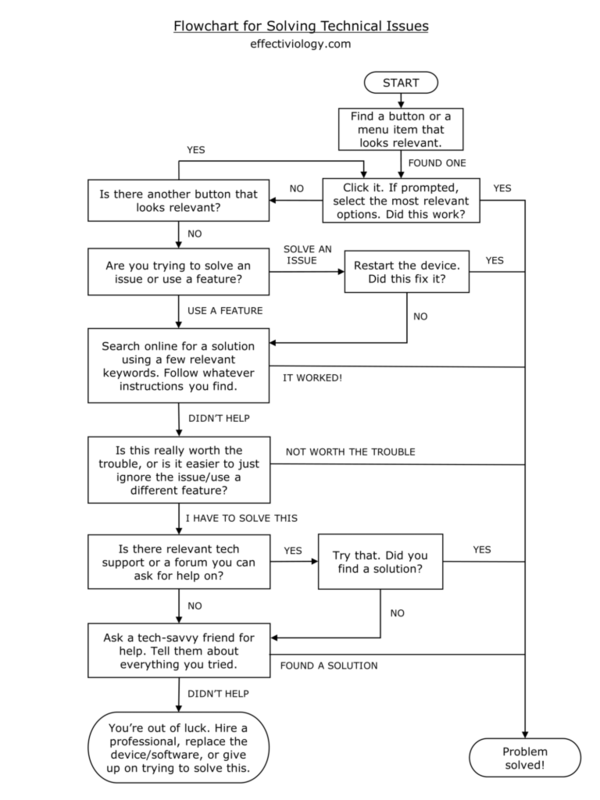 In fact, by following the steps outlined in the upcoming flowchart, you will be able to solve nearly all of the issues that you encounter, whether they’re in your computer, in your phone, or in any of your other devices. If you have a friend or a colleague whom you always thought of as a tech/computer expert, then know that this is most likely what they do each time you ask them for help. In fact, as long as you follow these steps, you can also become a local expert, even if you have no previous technical skills. The chart itself is pretty self-explanatory, but there is a brief explanation afterward if you’re interested. Even if this looks complex at first, give it a shot; you’ll find that it’s surprisingly straightforward. If you’d like to print this flowchart out, here’s the PDF version. I also want to give credit to this great flowchart from xkcd for the original idea. The chart in the current article adds a few important steps, such as restarting your device. Find a relevant button/menu item and click it. In most cases, something relevant should be easy to find. Try to play around with the options and settings a bit if you’re not sure what to do. Often, you can find the solution easily yourself if you’re just willing to look for it and try things out. If you’re trying to fix a problem, restart the device. Doing this solves a huge amount of technical issues. If you’re not sure how to restart your device, search online for instructions. Make sure that you’re restarting the device itself, and not just the screen, if the two are separate. Note that it’s generally preferable to turn the device off completely, wait 10 seconds, and then turn it back on; this is because it sometimes takes a while for all the components to power down, and for the capacitors to discharge. Search online for a solution using a few relevant keywords. Odds are that someone has encountered this issue before. If they did, there will often be a digital record of the solution online. If you’re not sure which keywords to use, pretend that you’re asking a tech expert for help, and use the same keywords that you would use when explaining to the expert what you’re trying to do. Consider whether this is worth the trouble. Often, trying to figure out how to use a certain feature can be much more work than trying to do the same thing using a different feature. Similarly, some issues are so minor that they’re not really worth the time and effort. The steps up to here require only a small amount of effort and have a high success rate, which is why this is a good cutoff point for deciding whether to continue searching for a solution. 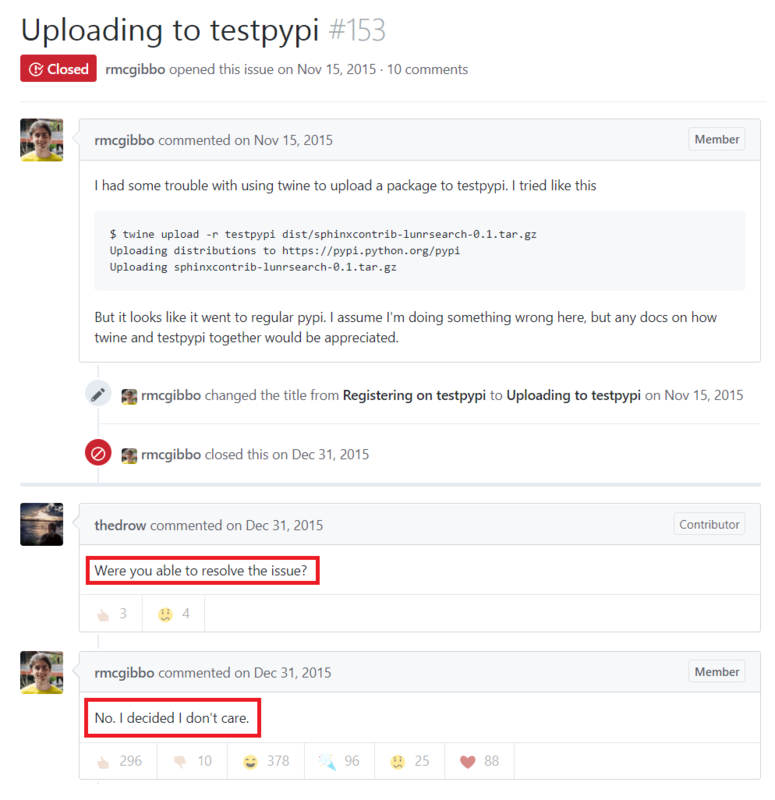 Post the question on a relevant forum or contact tech support. This can help in cases where you can’t find the solution yourself. The benefit of asking for help in a relevant forum is that you can usually reach a high concentration of experts, who will sometimes be able to answer in a minute questions that you would have otherwise spent hours trying to find the answer to. Note that these forums tend to have strict posting rules, so make sure to dedicate two minutes to read them before posting. Ask someone for help. If you decide to ask someone for help, make sure to tell them what you already tried. This can help them find a solution, and it shows that you put some effort into solving the issue before coming to them. Keep in mind that unless they themselves are experts on the topic, they will probably follow the same steps outlined here, though they might be able to find something that you missed. This is also often true for hired, professional help. A lot of people have a sort of learned helpless when it comes to technological issues. This means that instead of trying to solve issues when they encounter them, they give up prematurely and simply assume that they won’t be able to find a solution. In reality, however, most issues are relatively easy to resolve, and once you recognize that technical experts and IT people generally follow the same steps you saw above, you will realize that you can often solve these issues yourself. Even if you are not a tech expert, you can solve nearly all technical issues by using a simple, systematic approach. The two basic things that you should try first are to find a relevant button or a menu item and click it, and to search for a solution online using a few relevant keywords, that describe your issue or what you’re trying to do. If you’re trying to solve a technical problem, restarting the device or software can often help. You can also try posting in relevant technical forums, though you should make sure to read through the posting guidelines before doing this. If this fails, and contacting tech support directly doesn’t work or isn’t a viable option, then you should consider asking a friend who’s good with technology or hiring a professional. Always consider whether it’s worth it to keep searching for a solution; sometimes it’s easier to ignore the issue, or to try and solve it from a different angle (for example, by using a different feature).